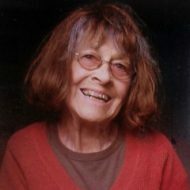 Mary Noble was a long standing and much loved member of the Guild, joining in 1978 as an associate, she held many posts in the management of the Guild, including membership secretary and administrator, and was made a Life Member. Mary was a well-respected jeweller who was largely self-taught. Her career took off when she was invited by Helen Newman (jeweller and current Life Member) to join her in making a collection of fashion-inspired pieces out of brass in the 1960’s. Both Helen and Mary were ex London art students who learnt from scratch and by trial and error. They developed their individual styles of making, and after success with the brass work, they started working independently in the early 1970’s, using silver for the first time. In 1972 Mary brought out her first range of chunky cast silver rings. Mary’s jewellery gained in reputation, selling in many galleries nationally. Her work was intricate, many of her pieces being unique and bespoke. She enjoyed using semi-precious stones for colour, as well as gold; and later on experimenting with enamels. One of Mary’s more unusual commissions was being asked to make a ring for an episode of Dr Who. She was known for her complex charm bracelets and in particular, her silver spoons, embellished on the stem with a three-dimensional small animal or bird. In the early 1990‘s her spoons gained in popularity after exposure in Country Living magazine. Mary also taught jewellery-making, firstly at Stroud College and later independently. She was responsible for starting off the careers of a number of jewellers, two of whom are now Guild members. Her wry sense of humour, kindness and great love of people will be greatly missed by many. Her legacy will be the enthusiasm, skills and influences she has imbued in others.